We’re all for trying out our clients’ wares – and never more so than when there’s delicious food at the end of it! 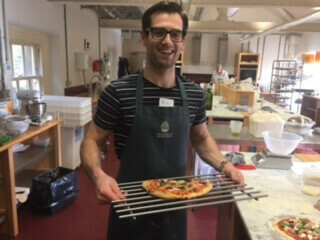 Sales director Alex Hill and account manager Dan Rawley recently had the great fortune to be invited along to new client the School of Artisan Food’s one-day Italian baking and pizza making course, much to the envy of everyone else in the office. The course is just one of dozens offered by the School, which – luckily for novice baker Dan – caters for all levels of expertise, from complete cooking beginners to master chefs. As its name suggests, the School, founded in 2009, promotes authentic artisan food and traditional skills that may otherwise be lost. The School even issues diplomas in artisan baking, and its food business startup course prepares bakers to set up their own businesses after graduating. Many students come from overseas to take part in the courses, some of which last up to six months. The School of Artisan Food experience starts when you enter the beautiful Welbeck Estate in the heart of Nottinghamshire’s Sherwood Forest where the School is based. Dating back to the 12th century and with royal connections galore, the Estate provides a breathtaking first impression. The Italian baking and pizza making course was taught by Emmanuel Hadjiandreou, an experienced South African baker who literally wrote the book on ‘How to Make Bread’. Fortunately Emmanuel was extremely patient and ensured that the course moved at a pace that was manageable for everyone but also meant there was always something on the go. On the menu for this course were classic Italian breads such as focaccia and ciabatta, as well as of course designing several pizzas each. Alex and Dan faced the daunting prospect of making all from scratch, but with Emmanuel’s guidance it was all achievable. The day started with the ciabatta, which was so enormous that it required a team effort to fold the dough at regular intervals as it threatened to overflow its container. Next came the focaccia, where the bakers had to create evenly spaced holes in the dough to achieve the distinctive focaccia appearance. The day finished with the pizzas, which saw some unusual but delicious combinations as bakers were given the freedom to choose their own toppings. Of course, the highlight of the course came at the end of the day, tasting the food that the bakers had worked hard to produce. Each baker left with a huge box of bread and a feeling of accomplishment, even taking home some extra pizza dough to allow the recipe to be recreated at home! Explore the School’s range of food courses here.